Here is a topic that recently came up on the big histology forum (Histonet), soaking artifact. Let me explain artifact a little before continuing, for those who do not know. An artifact is an unusual appearance made to the tissue, after staining and looking at through the microscope, that under normal circumstance would not be there. This can be caused by a variety of reasons, under fixation, improper processing, cutting issues, staining artifacts, and or cover slipping problems. All of these artifacts listed create microscopic issues that can impede the proper diagnosis for that particular tissue slide. Soaking refers to the technique of rehydrating the “faced” blocks, to allow the tissue to rehydrate before cutting to improve the quality of sectioning. The soaking is usually done by placing faced blocks into a cold wet surface like an ice cube tray or maybe a tray of melting ice chips. Paraffin embedded blocks are “faced” to expose the underlying tissue (s) before cutting. A veteran of 25 years was told by a supervisor, we will refer to him as “Joe” for easy reference, to use a cold plate only before cutting tissue blocks. This is typical for hospital based histology labs cutting only human tissues. Joe stated that soaking tissues in water or ice causes artifact. The type of artifact was not disclosed or mentioned. This question had been asked on the forum and got a host of different responses from people all over the world. A reference was made to the Lee Luna AFIP book that states “when cutting paraffin blocks rehydrate! Rehydrate, rehydrate”. One person said “The only “soaking” artifacts that I can think of would be caused by; – soaking too long in water (minutes instead of a few seconds) – soaking under-processed tissue in water”. 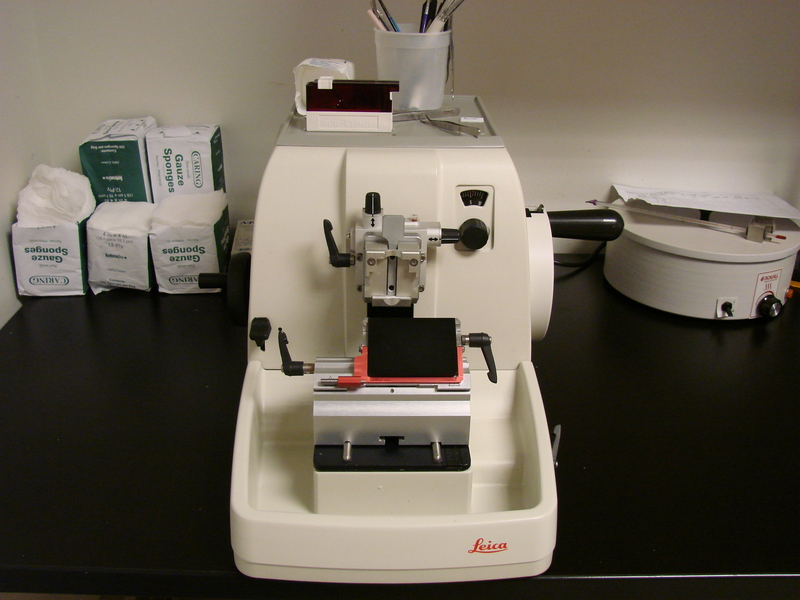 There are many experts in the field of histology. Most of them have been in the field for 20 or more years. One such “expert” is Peggy A. Wenk, HTL(ASCP)SLS. She has been teaching histology for over 20 years at a hospital that prefers to groom their own histology technicians before hiring. She responded to this question concurring in long detail about soaking artifact created from sitting in water too long. I also believe this to be true from years of cutting experience in both animal and human labs, the amount of time to create that soaking artifact can differ greatly depending on tissue types and animal verse human tissues. The type of tissue, meaning different organs, soaks up water at different rates. Typically the very soft tissues like brain, spinal cord, nerves, liver and some skins will soak the fastest and must be watched closely. If these tissues are allowed soak in water too long, the extra tissue must be cut away (lost forever) to reach the ideal tissue sections. In order to make optimal cutting results when soaking tissues in cold water, pay attention to the type of tissues being cut. A good way in determining block readiness, is to take the block out of the water, completely dry and run your finger along to be cut surface of the block. If the tissue (s) are raised, (out of the block a little) it is ready to be cut. Determining this is a little tricky at first, so check each tissue block 5, 10, 15, 20 minutes after placing in water. This will make sure tissues are caught before the over soaking occurs. If tissues are raised after 5 minutes, then make sure there is no water on the block and begin to cut. If not, then place back into the water and check again at the 10 minute mark. Repeat as necessary. If there is a critical point at which the tissue must be cut, to make a diagnosis, but the soaking process has already reached further than this point, there is no way to go back to retrieve this point, the over-soaked tissue will be cut away. If one tried to take the block out of the water and let it dry, this would cause the tissue to become hard and brittle after all the water was out. Then this brittle tissue would have to be cut away (faced) to allow the new tissue to be again soaked and cut. There is a marked difference between human and animal tissues. Human tissues are considerably more delicate than animal and need to be cut with different tactics. Therefore the only soaking artifact agreed on by the majority of histology technicians was the possibility of over soaking prior to cutting. This over soaking leads to tissue loss. No microscope artifacts were eluded to for soaking tissues in water versus cold plate use. When soaking tissues in cold water pay attention to time and type of tissue. I quite like reading through a post that will make people think. Also, thank you for allowing me to comment! therefore I am going tto tell her. regularly. I’m fairly sure I’ll be told plenty of new stuff right here! Thanks for sharing. I enjoyed reading your post on, “Soaking Artifact When Cutting Paraffin Block”.